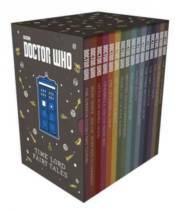 With 16 hardback books each containing a fairy tale set in the world of Doctor Who, this slipcase edition ofTime Lord Fairy Tales includes a brand new story for 2016: The Emperor Dalek's New Clothes. Time Lord Fairy Tales contains legendary stories of monsters, mysteries, villains and heroes from across the Whoniverse. A beautifully illustrated collection of dark and dangerous Whovian fairy tales, this slipcase is the perfect gift for any trueDoctor Who fan.